One type of mirror used in everyday life is the convex mirror. The convex mirror has curved shapes, where the mirror surface which reflects light, curve forward. If you have ever seen a motorcycle or car rearview mirror, of course, you already know the use of the convex mirrors in everyday life. Convex mirrors are used as rearview mirrors because the images formed by convex mirrors are upright and the images are smaller than objects so that it has the broader range of views. In addition to the smaller image size, all image formed by the convex mirrors are virtual. 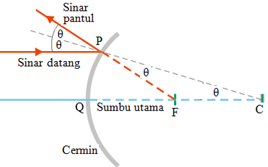 If the surface of a convex mirror that reflects light is exposed to a very distant object such as sunrays, then the beam of light emitted by the sun will parallel with the principal axis of the convex mirror, as shown in the figure below. The principal axis is an imaginary line perpendicular to the center of the convex mirror surface. In the figure below, the principal axis coincides with the focal point (F) of the convex mirror. When strikes the surface of a convex mirror, each beam of light fulfill the law of reflection of light, where the angle of incidence is the same as the angle of reflection. If the dashed line is drawn from the base of the reflected light, all the dashed lines intersect at the same point, and this point is called the focal point (F) of the convex mirror. The human eye sees the beam of light moving on a straight path and all the reflected light as if coming from the focal point of a convex mirror. The focal point is the image point of an object that is very far from the surface of the convex mirror, for example, sun and image are virtual. Focal length (f) is the distance between the focal point (F) and the convex mirror surface. Point C is the center point of the convex mirror curvature. The focal length of the convex mirror is f (focal length = f = FQ) and the radius of curvature of the convex mirror is r (radius of curvature = r = CQ = CP). The concave mirrors can form real and virtual images while the convex mirrors can only form virtual images. Regarding the image formation of an object by the convex mirrors has been explained in detail in the topic of image formation by the convex mirror. When a convex mirror reflects the light coming towards the convex mirror surface, the direction of the reflected light seems to come from the focal point of the convex mirror and the center point of the curvature of the convex mirror. Because light does not pass behind a convex mirror, the image formed is a virtual image. If you place the screen in a position where there is a virtual image, there is no image on the screen. The virtual image exists because the human eye sees rays of light moving straight and looks as if the beams are coming from the point where the virtual image is.